The attached was found by me in a bunch of dredged shells in Amuay, Paraguana Peninsula, Venezuela last month. I hope the size can be determined from my fingers. Thanks, Ron in Olympia. 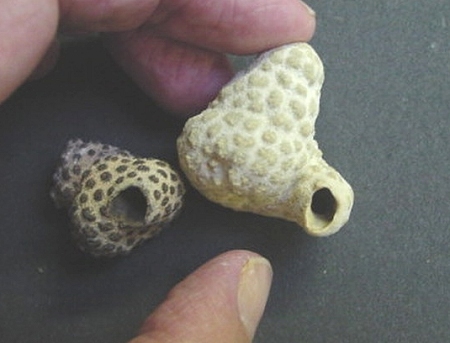 Those look like a species of Hippoporidra, a bryozoan colony that builds its structure on a small gastropod shell. The shell is often then inhabited by a hermit crab...Tom E.
I agree with Tom. -A congener has a somewhat different "shell" topology, and is more familiar to Florida and other Gulf of Mexico offshore collectors. The late June Dawley wrote a short paper on that species, the "Texas Longhorn;" and its symbiont. The article is posted at: http://www.jaxshells.org/jdawley.htm ...Harry L.
Hey all;- I have seen (collected) several Olive shells in South Carolina with just such Bryozoan colonies attached. They can generally be removed in one piece. I haven't found any of them inhabited by crabs. Perhaps it is because the Olives are too heavy for their siize for the crab to move in comfortably. I suppose the colonies would also grow on whelks---but I haven't noticed. This is definitely a hermitcrab-associate bryozoan. The same genus (and probably species) occurs in NZ, and I have dredged them. The colony starts on a shell inhabited by a crab, and overgrows the aperture, producing a tube...Andrew G.